Studies have shown that the amount of tail rocker you prefer is directly correlated with how flat you like your brims. The DPS Crayonix Cap is basically oozing style and coolness. 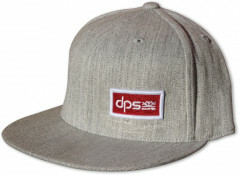 Flat brim, flexfit, thick embroidery, and a DPS Logo. With its cotton/poly-blend composition, the Crayonix Cap is ready to be whipped out at any party, social gathering, or spring tour.